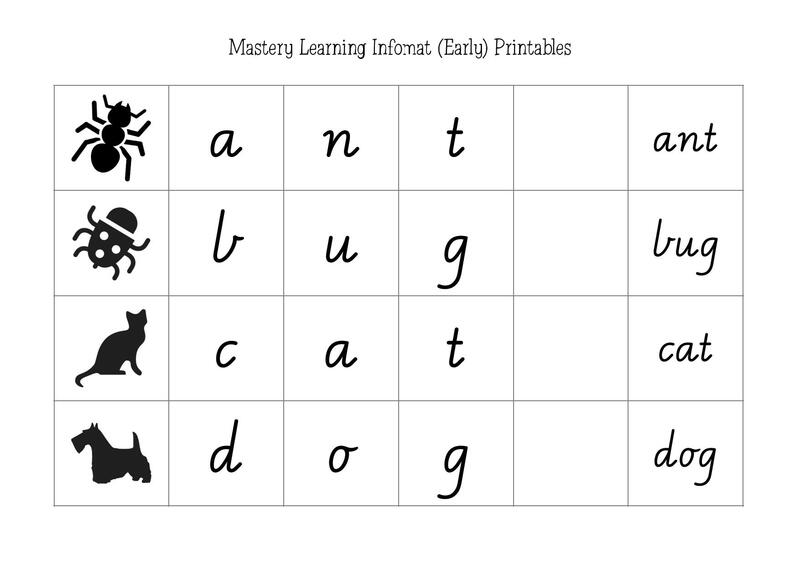 Students can now have continuous access to phonics sounds for writing and maths facts throughout the day and teachers can utilise an educational tool to support cross-curricular learning. These double-sided high quality screen-printed school desk mats are manufactured in Perth on durable PVC. Measuring 58 x 39cm, they fit on a wide variety of Australian school desks. 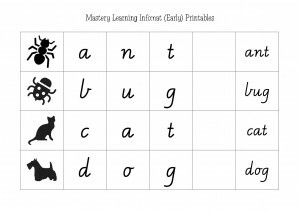 Mastery Learning Infomats are supported by a complete set of free matching phonics printables for use in the Picture / Sounds / Word spaces and an ever-increasing list of activities available through the Teacher’s Notes (both available through the free Flashcard Club). 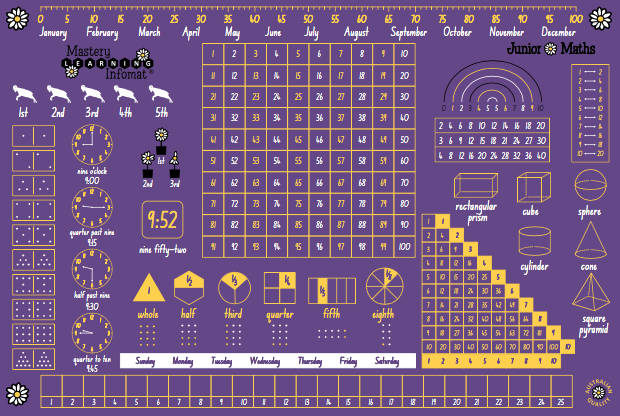 Infomats are available singularly at $16.95 or as a Class Set of 25 ($410.76). Alternatively they may be added to school booklists Australia-wide. Infomats are currently manufactured in NSW or VIC Mod font. 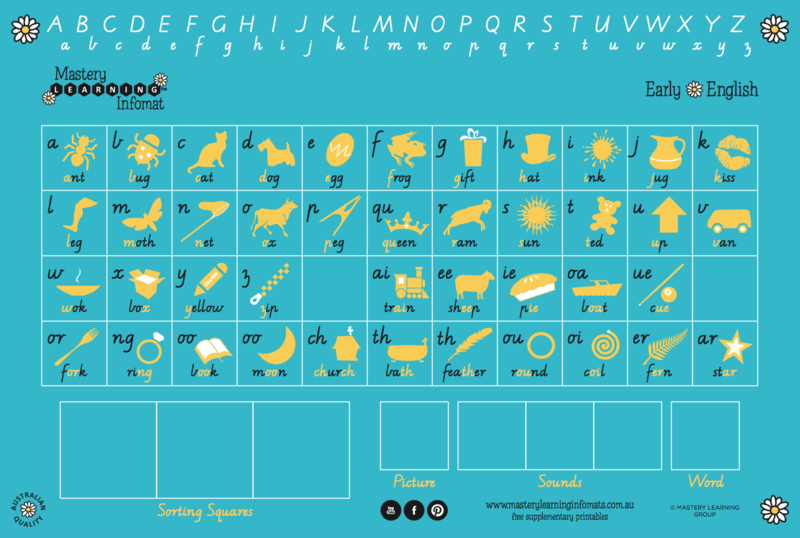 The Early English side of the desk mat is supported by free printables for sorting and matching words and sounds. The Early Maths side provides spaces for manipulatives like wooden cubes for hands-on addition and subtraction and areas for sorting and sharing materials. It is available in WA/VIC Mod font. 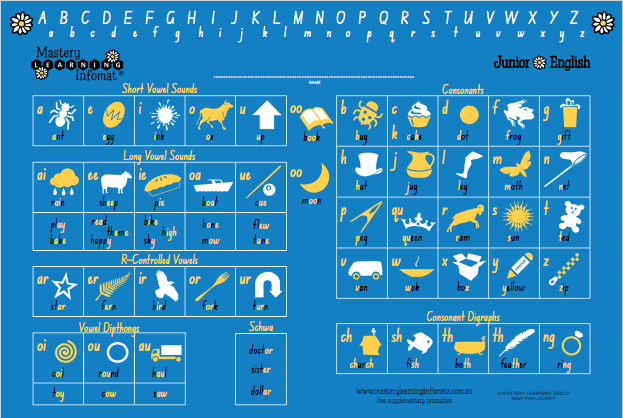 The Junior English side of the desk mat introduces the classification of sounds and alternative sounds. 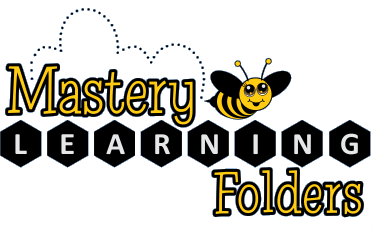 The Junior Maths side provides a wide variety of junior primary maths reference content including fractions, number lines, operation grids, 2D shapes and 3D objects, partitioning, hundred’s square and basic facts. It is available in NSW or VIC Mod font.